Get Free Standard Shipping on in-stock Plato 170 Series Cutters. To take advantage of this discount, just add an eligible cutter to your shopping cart. Our Featured Product promo is valid Monday, September 4, 2017, through Friday, September 8, 2017. These 170 Series Cutters feature ergonomic design, economical prices, and the ability to cut a variety of leads and wires. The 170 Series designs reduce cutting effort and reduce operator fatigue. See each cutter’s product page for more details. 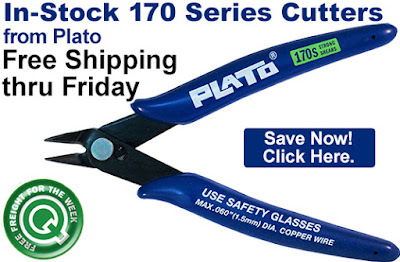 Click here to shop for in-stock Plato 170 Series Cutters. For further questions, call us (800-966-6020), or send us an email. Please note: This promo is valid only at QSource.com.